It is when our lives are full and busy that we need our daily meditation to help center us for the day. Ironically, when we get busy, the first thing that tends to get cut back is our meditation practice. We have less time and a lot on our plates, so it makes sense that this happens, but in the end it doesn’t really help us. Most of us know from experience that we function much better when we give ourselves time each day to sit in silence. And the more we have to do, the more we need that solitary, quiet time for the day ahead. As a result, while it may sound counterintuitive, it is during busy times that we most need to spend more time in meditation rather than less. By being quiet and listening to the universe, we will be given what we need to get through our day. Expanding our morning meditation by just 10 minutes can make a big difference, as can the addition of short meditations into our daily schedule. The truth is, no matter how busy we are, unless we are in the midst of a crisis we always have five or 10 minutes to spare. The key is convincing ourselves that spending that time in meditation is the most fruitful choice. We could be getting our dishes done or heading into work earlier instead, so it’s important that we come to value the importance of meditation in the context of all the other things competing for attention in our lives. 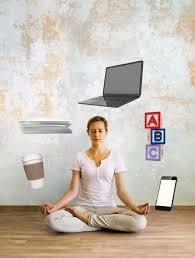 All we have to do to discover whether it works to meditate more when we are busy is to try it. We can start by creating more time in the morning, either by getting up earlier or by preparing breakfast the night before and using the extra time for meditation. We can also add short meditation breaks into our schedule, from five minutes before or after lunch to a meditation at night before we go to sleep. When we come from a place of centered calm, we are more effective in handling our busy schedules and more able to keep it all in perspective. If more time in meditation means less time feeling anxious, panicky, and overwhelmed, then it’s certainly worth the extra time.